As many people know May 2011 marks the 100th birthday of art/food/horror/acting legend Vincent Price. Places all over the world are celebrating this “Vincentennial” with screenings, such as Cinema St. Louis, special websites, and other events. 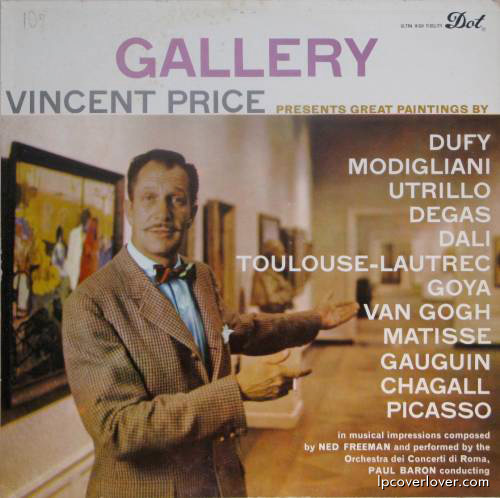 What many people don’t know much about is Price’s visual obsession with art. People are generally surprised to discover there is the Vincent Price Art Museum in Los Angeles, a gallery space to which his collection has been donated and that has given East Los Angeles College unprecedented access to a serious body of work. I even have the most incredible book on Impressionist paintings at the Louvre that includes, in addition to slides, a 45 record with Price narrating art commentary. Because somehow this aspect to his life has gotten lost in his popular historical persona, I am going to celebrate 100 years of Vincent Price by continuing to post his thoughts on art from his “visual autobiography” I Like What I Know.